Air pollution is known as a root cause of many diseases and health problems and also known as an aggravating factor of many life threatening diseases. Poor and middle class people are most affected by air pollution. According to WHO report, 1.3 million people die every year because of reasons attributable to air pollution. After having masks, cloths, multiple transport options, knowing polluted & non-polluted areas, options to change their time of travel & place of work and medical support, 1.3 million human beings are dying every year because of air pollution. What about birds? What about domestic animals? What about small creatures that roam around trees? They don't have hands to cover their nose for bad smell. They don't know whether the rain water has acids or bases. They don’t have doctors to check-up when they feel burning in their lungs. Billions of living creatures including trees are affected by air pollution. Many millions of small creatures are dying every year because of human induced air pollution. We need to make sure that clean water and clean air are available for all living creatures to support their fundamental right to live. Air pollution affects poor and middle class people in multiple dimensions. First it affects their health. Health problems reduce their productivity. That reduces their income and further opportunities. 50% of world population is living in highly polluted cities. 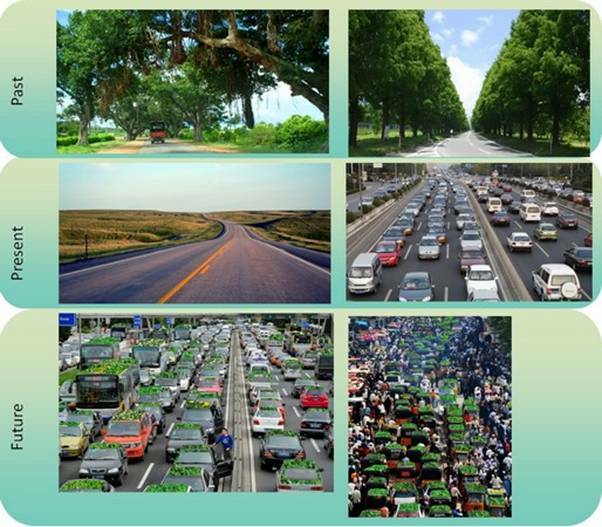 A perfect solution for air pollution can benefit health of 50% world population. Particulates get mixed with rain water so rain water is getting polluted because of air pollution. Polluted rain water pollutes rivers and lakes and increases health risks of poor people, animals and other species. Air pollution in slow moving traffic while going for work or coming back from work arouses anger. That affects life and relations. People avoid public transport, bicycle and walking along beside the road mainly because of air pollution. Cars run AC even when outside temperature is comfortable because of air pollution. 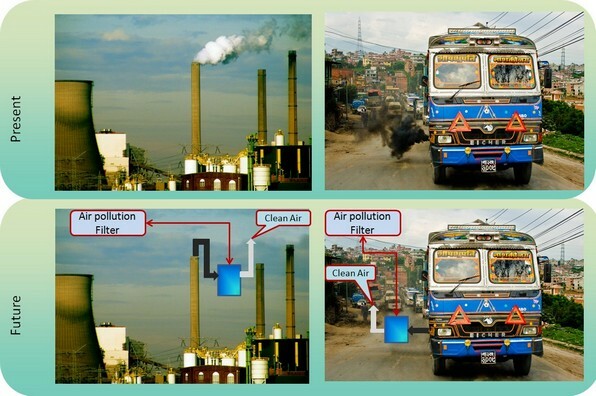 If we clear air pollution, fuel consumption reduces drastically. That further reduces air pollution, improves health and also improves economy. According to World Health Organization (WHO), in the year 2012, ambient (outdoor) air pollution was responsible for 3.7 million deaths, representing 6.7% of the total deaths. Worldwide, ambient air pollution is estimated to cause about 16% of the lung cancer deaths, 11% of chronic obstructive pulmonary disease (COPD) deaths, more than 20% of ischaemic heart disease and stroke, and about 13% of respiratory infection deaths. Apart from deaths, number of people affected by health problems because of air pollution is uncountable. For details of all health problems caused by air pollution, how much particulate matter is getting accumulated in the air and who all are affected, please read WHO fact sheet on “Air quality and health”. Factories release large quantities of particulates continuously into the air. Vehicles produce very less quantity of particulates compared to a factory. But large number of vehicles and high density of vehicles on the road in peak hours produce huge quantity of particulates where density of human population is high. Air pollution from vehicles largely damages health of people. Air pollution from factories damages whole nature. The major part of air pollution consists of pollutants of factories and vehicles. Other sources of air pollution are generators and other equipments that burn fuel. Solid and liquid pollutants (particulates), when inhaled, stick to lung walls and damage them over a period of time. Very small particulates get mixed in blood and reach all parts of the body including brain and other important nerves and cause many irreversible damages. Along with humans, these health hazards are common in animals, birds and all creatures that breathe air. Heavy particulates in the air are pulled down to ground with gravity when air flow slows down. These particulates settle on leaves of trees and form a solid layer. This solid layer blocks sun light and carbon dioxide which are essential for photosynthesis and for a leaf to live. As solid particulates are present in air every day, solid layers are formed on new leaves also. Trees are unable to create their food unless rains wash out these solid layers regularly. With heavy and continuous solid air pollution from factories, smoke clouds are formed in the sky. When it rains, the particulates dissolve into or get mixed with rain water. The polluted rain water pollutes rivers, lakes, streams and all other water bodies. With rain water harvesting and ground water refilling, the polluted rain water reaches underground and pollutes ground water also. All the creatures including trees (other than sea-creatures) that depend on water are also facing health hazards. Temperature on earth depends on altitude. As solar rays and solar heat reach ground, surface of earth (zero altitude or sea level) records highest temperature in the atmosphere and the temperature gradually reduces as altitude increases. Water stays in solid state (ice) on tall mountains from a particular altitude and above where the temperature is low. Solid clouds (or smoke clouds) stay at higher altitude, block solar light, consume solar heat and behave as surface of earth. With continuous consumption of heat, these clouds gain "zero altitude temperature" and start a new temperature range from their altitude and above. Automatically mountains that have ice at higher altitudes start melting as temperature at that altitude has increased. Other high altitude areas on earth also gain high temperatures. In other words, solid clouds almost double high temperature range on earth. Solid particulates that travel to the poles settle down on ice and polar ice starts melting because ice with solid dust melts faster than clean shining ice. Large accumulation of carbon dioxide is actually good for growth of trees. With availability of sufficient amounts of carbon dioxide in the environment, tree can consume lot of solar light and heat and grow faster. As trees grow they consume more carbon dioxide and more solar heat and produce oxygen. Carbon monoxide burns in presence of oxygen and becomes carbon dioxide. And the cycle continues. So levels of carbon dioxide and oxygen in the environment should get balanced automatically. But the percentage of carbon dioxide is growing continuously in the environment. Because huge number of trees are getting cut and leaves of living trees are covered with solid dust (particulates). Huge amounts of carbon dioxide and solar light are available in the environment but inaccessible to leaves. Slowly the leaves die and then the trees die. Uses only water for filtering the pollutants. Sea water, rain water or recycled water can be used for vehicles and factories. Avoids forming of solid particulate layer on leaves and accelerates carbon dioxide (CO2) consumption in the environment. This solution clears air pollution caused by factories, vehicles and other products that burn fuel (like generators, etc) and also creates greenery. Assume that you are in a taxi or non-AC car or in auto rickshaw and waiting for green signal near a junction, a bus or truck comes next to your vehicle and fills your vehicle with its exhaust gases. You cannot move from there and the heavy vehicle does not stop its engine and it is the most horrible thing that happens daily for most of us. Pedestrians, people waiting for public transport, bicyclists, 2-wheeler motorists and all other people travelling in non-AC vehicles are heavily affected by the exhaust gases of heavy vehicles. By extending exhaust pipe to the height of the vehicle, direct breathing of exhaust gases can be minimized to a large extent. That directly improves health and lives of many people. Extending exhaust pipe to the height of the vehicle is not new. Tractors are already having end of exhaust pipe above their height. Similar thing can be done for all vehicles. 2. Clean carbon dioxide (CO2) can be pumped to forests by connecting factories and forests with pipes. Some factories produce huge amounts of carbon dioxide and carbon monoxide. We need to connect these factories with nearby forests with gas pipes so that the exhausted carbon dioxide can be pumped to the forests directly after all particulates are filtered. This improves carbon dioxide consumption. Read Global Warming article to understand how air pollution creates global warming.